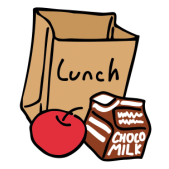 ​The PTA will again be providing hot lunch program in 2016 - 2017. Ordering Details Coming Next Week! Ordering is now OPEN until Monday, September 12. No late orders will be accepted after this date. - Order via MySchoolAnywhere at the "Our Store" during an open block time. If you don't have a MySchoolAnywhere account, go here. *Pizza ordering will be done in 3 separate blocks: 1st Block is 9/19-12/19.